Summary from Boom: BOOM! Studios and DC Comics are proud to bring together two classic properties in a historic crossover event. When Taylor goes missing, Cornelius investigates and discovers an ancient ring, unlike anything the universe has ever seen.As its power echoes through the stars, the Guardians of the Universe must reveal to their Lanterns a secret they had hoped would remain buried. 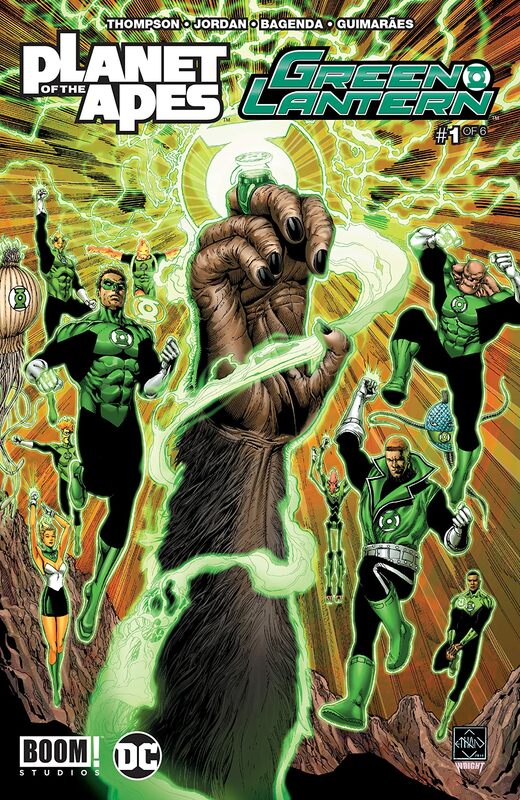 With the Green Lantern Corps, led by Hal Jordan, racing to get to the source of this power before Sinestro can get his hands on it, they will discover a truth that will change them forever on…THE PLANET OF THE APES. This has been one of the few comics that I have eagerly been waiting for. I absolutely loved “Dawn of the Planet of the Apes“, and “Rise of the Planet of the Apes” is one of my all time favorite Sci-Fi movies. Plus, with the Green Lantern being one of my favorite superheroes, how could I not love this? This first issue is mostly world building due to setting up the rest of the 6 issues in the mini series. However, they do a fantastic job with characters such as Hal Jordan, Guy Gardner, and the infamous Sinestro. Bringing in Justin Jordan to work on this project was a great move for Boom/DC since he’s previously worked with a majority of these characters during his time on DC Comics New Guardians during the New 52. I mentioned my love for the new franchise, but this book includes a few beloved characters from the original Planet of The Apes. Cornelius and Nova are the main apes, in this issue at least, and the story seems to take place sometime after the original movie ends. 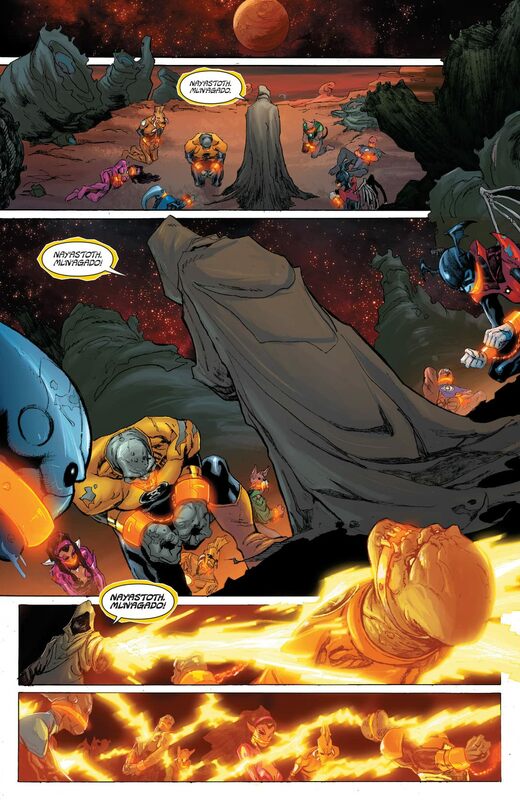 Cornelius ends sup finding some type of ring inside a crater and this ring just happened to once belong to the notorious Larfleeze. 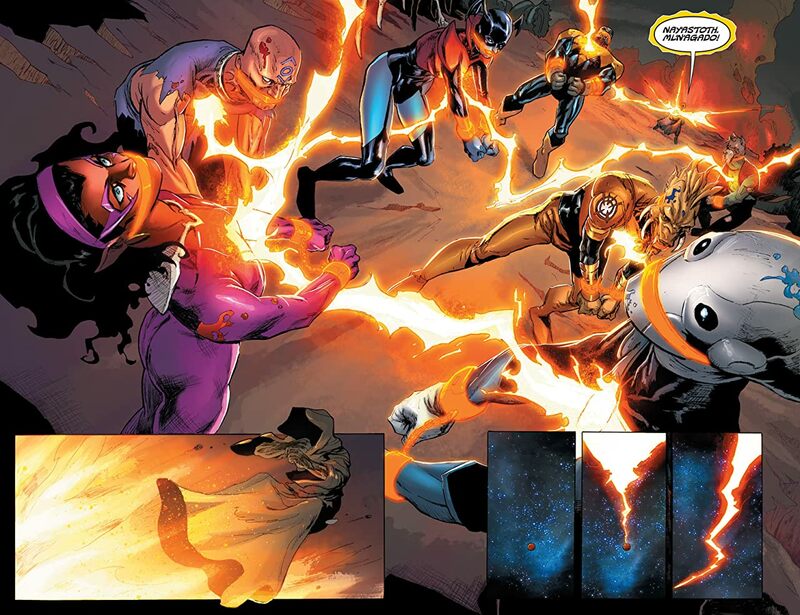 With the uses of Sinestro and Larfleeze this is already building up to be an epic story involving two beloved franchises. Barnaby Bagenda worked with Tom King during his run on the DC series The Omega Men and also worked on Evil Dead 2 by Space Goat Productions. 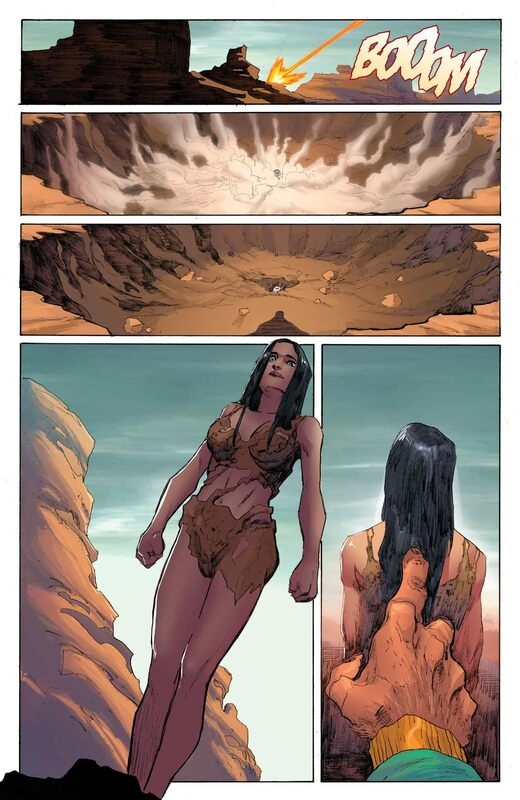 Bagenda does a superb job with the art in this issues and makes it truly look at times like a watercolor painting but is still able to have a great amount of focus in the detail. Only one issue in and I am already itching for more of his art. I personally think that Bagenda and Jordan make a fantastic team, and I can’t wait to see what type of constructs and images these guys come up with. Justin Jordan does a fantastic job tying these two properties together, Bagenda’s artwork is phenomenal, and this has turned out to be the crossover I never knew I wanted. I literally couldn’t be more happy for it! If you are at your LCS this week and you see this book on the shelf, be sure to pick it up, especially if you are a fan of either franchise. Let us know in the comments below if you picked this series up and if you enjoyed it or not. The Get Up Kids are a great band for this style of a comic, and their song Like A Man Possessed is a perfect pairing for this book. I would dare say Cornelius is a man possessed after this issue. I’m sorry, that was a terrible dad joke, but whatever. I made it and I don’t care.